The two-wheeled, self-balancing toy was left charging at the Metropolitan Apartments on Old Georgetown Road when it suddenly went up in flames, fire officials say. 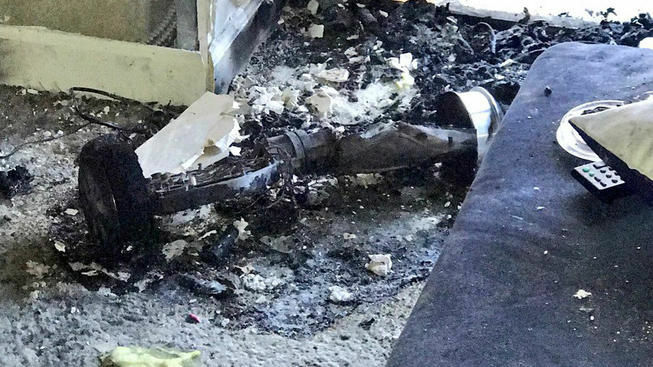 WASHINGTON — A malfunctioning hoverboard is thought to have caused a Bethesda, Maryland apartment fire which led to $100,000 in damages on Sunday. A Montgomery County fire official said the two-wheeled, self-balancing toy was left charging at the Metropolitan Apartments on Old Georgetown Road when it suddenly went up in flames. Photos tweeted by Montgomery County Fire spokesman Pete Piringer showed the charred husk of a hoverboard, with significant burns to the apartment’s floor and walls. Despite not burning hot enough to set off the sprinkler system, Peringer said the fire dealt an estimated $75,000 in damage to the building, in addition to $25,000 worth of property in the apartment itself. The apartment’s occupants escaped unharmed. Video showed multiple engines responding to smoke drifting from a fifth floor balcony. Three adults and two children were displaced by the incident. Fire officials have yet to pinpoint the cause of the malfunction, although various models of hoverboards have been recalled in recent years over a fire hazard risk stemming from faulty battery packs. In 2017, seven hoverboard manufacturers recalled products after reports of fires caused by overheating batteries. It is unclear if the hoverboard in the Bethesda fire was a recalled product.